Space shuttle Discovery thunders off the launch pad at NASA's Kennedy Space Center in Florida on May 31, 2008 to begine the STS-124 mission. Editor's Note: This story was updated at 5:25 p.m. EDT. CAPE CANAVERAL, Fla. - NASA?s shuttle Discovery rocketed into spaceSaturday with a massive Japanese laboratory bound for the International SpaceStation. Discovery shot up into the sky at 5:02 p.m. EDT (2102 GMT) from itsseaside Launch Pad 39A here at NASA?s Kennedy Space Center carrying what willsoon be the largest single room aboard the space station - the tour bus-sizedmain cabin of the Japan?s Kibo (?hope? in Japanese) laboratory. ?While we've all prepared for this event today, the discoveries fromKibo will definitely offer hope for tomorrow,? said Discovery?s commander MarkKelly just before launch. ?Now stand by for the greatest show on Earth.? During their planned14-day mission, Discovery?s seven crewmembers will perform three spacewalksto install the $1 billion Kibo laboratory, relocate its smaller storage cabinfrom its current perch to the main room, and activate the laboratory?s roboticarm. The shuttle is slated to dock at the International Space Station (ISS) onMonday afternoon. Watching the launch here was Kelly?s identical twin brother, ScottKelly, who is also a veteran astronaut. Their father Richard celebrated his68th birthday while his son Mark launched into space. ?I?m excited for him - it?s an amazing experience,? Scott Kelly, aveteran spaceflyer, told SPACE.com this morning. ?I think it?s a uniqueprivilege to not only fly in space but then have your brother that you can talkabout it with and he understands exactly what you?re talking about ?cause he?sshared those experiences and memories.? Discovery?s STS-124 mission is the second of three planned shuttleflights to bring all of Kibo?s elements into space. It follows the shuttleEndeavour?s March 2008 flight, which delivered the small storage room, andprecedes a planned spring 2009 mission to deliver Kibo?s porch-like externalplatform. The launch of Kibo?smain element represents the fruition of more than 20 years of work andplanning by Japan to add its own segment to the space station. The new moduleis about 37 feet (11 meters) long and about 14.4 feet (4.4 meters) wide. Itweighs about 32,000 pounds (14,514 kg). ?It shows ISS is coming into the stage of the truly international,? saidYoshiyuki Hasegawa, Japanese Experiment Module program manager. ?This Kibo isknown for the Japanese people, even child and old man and government senator.Even my mother knows that Kibo is the international station and made in Japan.? Japan?s stake in Discovery?s mission is embodied by crewmember AkihikoHoshide, a Japan Aerospace Exploration Agency astronaut who will serve as theresident Kibo expert when he and his crewmates work to install the lab on theISS. ?This is a big step for the Japanese community, the science communityespecially, because that means that they can start their own science,? Hoshidesaid before launch. ?It?s a big milestone for Japan.? Other STS-124astronauts include pilot Ken Ham, mission specialist Karen Nyberg - whobecame the 50th woman to fly in space with today?s launch - and fellow NASAspaceflyers Rob Garan, Mike Fossum and Greg Chamitoff.Chamitoff will stay aboard the orbital outpost after Discovery departs,replacing U.S. astronaut Garrett Reisman as a member of the ISS?s three-manExpedition 17 crew. Reisman is slated to return with Discovery during itsplanned June 14 landing. ?The idea of just living in space for a longperiod of time and knowing what it?s like to live there, I think, is one thingI?m looking forward to,? Chamitoff, a first-time spaceflyer, said beforeflight. ?That?s going to be an amazing experience up there just to have onepart of one step of getting humanity up to the stars.? Besides dropping off the Kibo lab and Chamitoff, Discovery is hauling afew other important pieces of cargo. The shuttle is carrying a replacement pump to fix the spacestation?s faulty toilet. The orbital loo, the only one on the ISS exceptfor the facilities on the docked Soyuz spacecraft, is working partially, thoughit is inconvenient and time-consuming. Space station residents are hoping thenew pump will fix the problem, though previous spare pumps have so far failedto do so. Discovery is also carrying an action figure of the Buzz Lightyearcharacter from the 1995 Disney-Pixar movie ?Toy Story.? By flying into space,the toy will perform educational demonstrations for kids and also fulfillBuzz?s goal of reaching ?infinity and beyond.? Today?s launch marks the third of up to five shuttle flights planned forthe busy 2008 year. Discovery?s voyage is the 123rd space shuttle mission tofly and the 26th trip to the ISS. NASA aims to retire the shuttle program in2010, with just 11 more shuttle flights planned to complete space stationconstruction and overhaul the Hubble Space Telescope. Discovery?sSTS-124 mission marks the shuttle?s 35th trip to space. In an unusual move, Discovery launched without its sensor-tipped roboticarm inspection boom aboard, in order to make room for its giant Japanesepayload, the largest ever launched to the ISS. Since Columbia?s tragedy in 2003, astronauts usually spend the dayfollowing launch using the boom to inspect their orbiter?s heat shield tilingfor damage such as that which caused the earlier disaster. Luckily, the previousshuttle flight, Endeavour?s STS-123 mission, left Discover?s boom waiting forit on the space station. ?After we launch, before we rendezvous, we?re going to use the shuttlearm and the camera that?s on the end of the shuttle arm to do as much of therudimentary inspection as we can of the wings of the orbiter,? Ham said in apreflight interview. ?After we undock, we will do the traditional detailedsurvey of the thermal protection system of the orbiter so that we can guaranteethat we are safe to enter.? The shuttle is scheduled to dock with the ISS at 1:54 p.m. EDT (1754GMT) on Monday. Upon the shuttle's arrival in space, mission control congratulated Kelly and his team. NASA is broadcasting Discovery's STS-124 mission live onNASA TV. 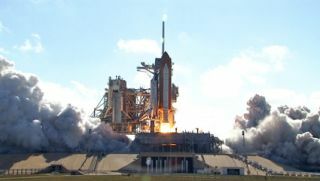 Click here forSPACE.com's shuttle mission updates and a live NASA TV feed.